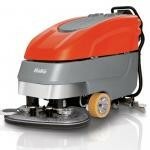 Scrubber-drier for efficient wet cleaning of medium and large sized areas. Simple handling, innovative technology and high performance ensures high standards of cleaning and hygiene with reduced running costs. Area performance up to 4,200m2/hr. Comes standard with Patented Hako Aqua Control System.